Whether you live in Liverpool and are looking for coach hire to anywhere else in the UK or you are organising a group trip to this exciting city, National Coach Hire can offer a relaxing, inexpensive and flexible service. These days there are many reasons why you might be heading to Liverpool. It could be to watch the football at the Kop, and to cheer on one of the world’s most famous teams. Or perhaps you’re heading there for the incredible music and club-scene that has made Liverpool famous over the years, from the fab four to the Zutons. Or perhaps it is simply to walk around and see the sights, and to sample the much loved Scouse humour, so famous throughout the rest of Britain, and by the same measure, the pride the locals feel for their city. There is a lot to be proud of too. Liverpool was made 2008 European Capital of Culture, and it is a city that has been treated to a wonderful facelift, with a fantastic mixture of classic and modern architecture, and an influx of culture that has changed the tone of the city. From new museums to new art galleries, to the waterfront and docks which were recently designated as a Unesco World Heritage Site, there is so much to see and do in Liverpool that coach hire really is the best way to fit it all in. Whether you need a coach there at the end of a night sampling the world famous nightlife or music scene, or perhaps to pick you up after a visit to The Cavern Club, or perhaps to fit in a trip to Anfield, home of Liverpool FC (or even their rivals Everton) National Coach Hire are experts in all things Liverpool. 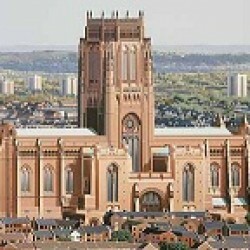 We can show you around all the sights, from famous landmarks like Albert Dock (now redeveloped into an amazing location with a number of fantastic galleries and museums), and the neo-Gothic Liverpool Cathedral as well as the Metropolitan Cathedral of Christ the King, and The Pier Head or St George’s Hall. Liverpool contains so many attractions that coach hire really is the best way to get around. Once you’re done with the landmarks, there’s the Beatles heritage to explore, as well as the Merseyside Museum, and the galleries, including the home of modern art in the North of England, the Tate Liverpool Gallery. 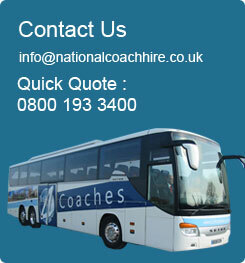 Whether it’s art or music, football or architecture, National Coach Hire can help you organize the perfect itinerary. And if you’re using Liverpool as a base to see the surrounding countryside, then let us take care of the stress whilst you sit back and enjoy the view. From the stunningly beautiful Lake District with incredible scenery and wildlife, to Celtic ruins and historical sites, a coach will allow you to take day trips (or longer) out into Lancashire. Whether you want to take a short walk in the Peak District National Park, or spend all day hiking the Penine Way or if you want to tackle the High Peak Trail on you mountain bike, National Coach Hire will be there at the end of the day to whisk you off the trail and back to the restaurants and hotels of Liverpool. If you should want to venture out to Manchester or Lancaster, the lights of Blackpool or the quieter beaches further south, National Coach Hire can take you wherever you wish to go, quickly, economically and in the most relaxed way possible.